Dezeen promotion: the winners of this year's AHEAD Awards for the Middle East and Africa include a safari retreat in Botswana and a five-star cliffside resort and spa in Oman. The awards celebrate various aspects of hospitality design, with entries assessed on aesthetics, guest experience and commercial viability by a panel of judges comprising leading hoteliers, architects and interior designers. Dubai's Jumeirah Al Naseem hotel by Woods Bagot and DSGN won two accolades this year: Guestrooms and Resort Hotel. The judges described the five-star hotel as "a new generation of beach resort for Dubai", praising the blending of indoor and outdoor spaces as well as the use of sliding screens to create rooms within rooms. 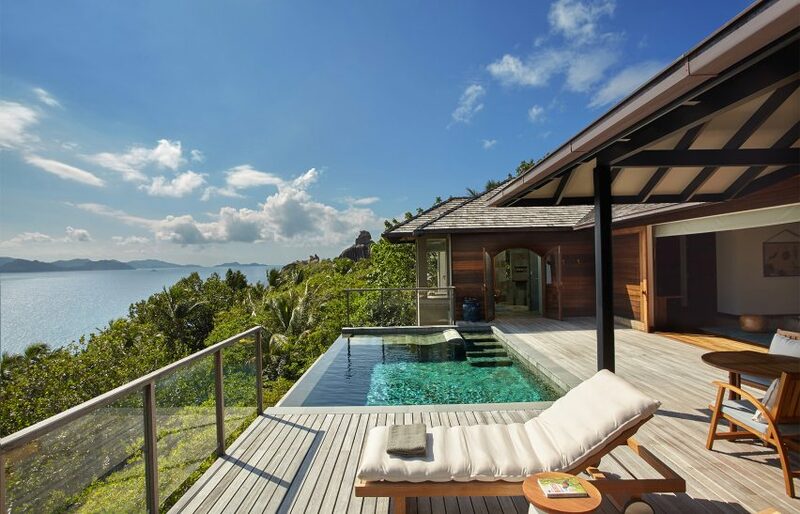 Six Senses Zil Pasyon resort in Seychelles designed by Studio RHE was also a double winner, for Landscape and Outdoor Spaces, and Suites. The island retreat – which features villa suites hidden by surrounding vegetation – won for its "seamless and sustainable" integration into the landscape. The award for Lodges and Tented Camps was granted to the Belmond Eagle Island Lodge in Botswana by DSA Architects International and Muza Lab. The design team was praised for its consideration of the hotel's location in the Okavango Delta, which is inscribed on the UNESCO World Heritage List. Cubano Lito at Ibis One Central Hotel in Dubai by Bishop Design took the Bar, Club or Lounge award for its mix of textures, furniture and lighting, which offer a modern take on a traditional Havana townhouse. Anantara Al Jabal Al Akhdar Resort's spa was praised for matching the hotel's reputation for the "highest five-star in the Middle East"
Anantara Al Jabal Al Akhdar Resort's Anantara Spa, which is located on a cliffside in Oman, was the winner of the Spa and Wellness category, while Rove Downtown hotel in Dubai by Stride Treglown International won two awards: New Concept of the Year and Events Space. Rüya at Grosvenor House hotel in Dubai won the award for the Restaurant category. The Conran and Partners-designed venue, which serves Anatolian cuisine, was chosen for its "melding of eastern and western influences in a coherent whole". The Four Seasons Hotel Dubai International Financial Centre by Tihany Design took home the AHEAD MEA Hotel of the Year award, as well as winning in the Urban Hotel category, for bringing a "genuinely new sense of intimate luxury" to the Dubai hotel industry. Other winners included: Kempinski Summerland Hotel & Resort in Beirut, which scooped the award for Hotel Renovation and Restoration; Le Royal Meridien Beach Resort and Spa in Dubai, winner of the Lobby and Public Spaces award; and Room Mate Emir hotel in Istanbul, which was victorious in the Visual Identity of the Year category. The event is the third of eight regional award ceremonies taking place around the world in 2017 and 2018, celebrating the best new hotels in Asia, the Americas, the Middle East and Africa, and Europe. These heats will culminate in a Global Biennale in 2019, which will see the regional winners compete head-to-head to decide a worldwide winner in each category.